Democracy in schools: are educators ready for teacher leadership? The aim of this research was to determine educators' perceptions of and readiness for teacher leadership. A total of 283 educators in the Eden and Central Karoo Education District in the Western Cape participated in the study. The participants included district officials, principals, and members of school management teams, as well as veteran, middle, and novice educators. A series of instruments was used to determine educators' perspectives, perceptions and readiness for teacher leadership, including the Teacher Leadership Readiness Instrument (TLRI). The results indicated that educators held positive assumptions about teacher leadership. Educators' preliminary leadership perceptions, assumptions about and readiness for teacher leadership proved that the majority of educators are ready for a more distributed, deep democratic leadership practice in schools. Educators acknowledged the need for continuous professional development in the area of teacher leadership. It was also found that as preliminary leadership perceptions of educators improve or strengthen, readiness for teacher leadership is also likely to improve or strengthen. These findings have significant implications for leadership practices, collaboration, capacity-building and improvement in schools, educators' self-esteem, motivation and productivity, as well as student outcomes. Effective school leadership and management are critical in ensuring successful outcomes for all involved. The South African education system has facilitated a process in which schools are guided from centralized to decentralized control. Various policies, embedded in the South African Schools Act (No 84 of 1996), have been implemented to provide for democratic school governance involving school managers, educators, parents and learners. In addition, School Self Evaluation (SSE) and Whole School Evaluation (WSE) have been implemented as accountability systems and processes. Although these policies and systems create the opportunity for teacher leadership to emerge in schools, they do not clarify what teacher leadership entails, nor do they provide guidelines on how teacher leadership should be introduced in schools. The role of school management teams in developing teacher leadership and how educators can lead beyond the classroom are not clarified also (Singh, 2007). A new conceptualization of leadership, as suggested by Senge (1990), where leadership is seen as the "collective capacity to do useful things and where leadership responsibility is widely shared beyond the principal" appears to be necessary to be sufficiently responsive to the complexity of contemporary school leadership demands. It suggests that models of leadership which appreciate teachers as leaders and provide for a paradigm of open, transparent and deep democratic leadership should be embraced (Lambert, 1998). Huber (in Lumby, Crow & Pashiardis, 2008) emphasized that schools can no longer be seen as static organizations that need to be run or administered, but rather as learning organizations that should continuously be developed or supported to develop themselves. Katzenmeyer and Moller (2001) asserted that teacher leadership should be positioned on 'centre stage in the leadership play'. The broad research aim of this study was to determine educators' perceptions of and readiness for teacher leadership in the Eden and Central Karoo Education District in the Western Cape province. An investigation with this focus is important because it can reveal aspects which impact negatively on collective, distributed leadership practices and school improvement, as well as educators' participation, engagement, commitment and job satis faction. Educational leadership is gradually being shifted towards a form of collective, shared, distributed and organisational responsibility, stretched over the school's social and situational contexts (Harris, 2008). School leaders and teachers therefore work in closer co-operation and collaboration with one another and it culminates in deep democratic involvement in leadership practice and collective capacity building (Senge, 1990). Distributed leadership is a model of leadership with three distinctive elements, namely, it belongs to a group or network of interacting individuals; it has open boundaries with no limits on who should be brought into leadership; and leadership depends more on expertise and this is distributed across the many and not the few (Woods, Bennett, Harvey & Wise, 2004). Parallel leadership provides for a link between school-based leadership, the improvement of school outcomes and also presents a model to explain the dynamics of that link. Parallel leadership can be defined as the process whereby effective teacher leaders and principals work collaborativelyto build school capacity (Crowther, Ferguson & Hann, 2009). Three distinctive qualities underpin the relationship and collective activity between teacher leaders and principals, namely, mutualism, a sense of shared purpose and the allowance for individual expression. Crowther et al. (2009) asserted that the process of parallelism can constitute sustainable school improvementonlythrough the dynamic interplayof effectiveprincipalship and effective teacher leadership. Teacher leadership, as one of the manifestations of distributed leadership, refers to teachers who are "leaders within and outside the classroom; identify with and contribute to a community of teacher learners and leaders; influence others to improve their teaching practice; and accept responsibility for realizing the goals of their leadership" (Katzenmeyer & Moller, 2001; 2009). Three implications are suggested, namely a different power relationship within the school where the distinctions between leaders and followers tend to become less obvious; the division of labour within the school will be affected as tasks are shared more widely; and opportunities will be created for all teachers to become leaders at various times (Muijs & Harris, 2007). Harrison and Lembeck (1996) characterized teacher leaders as individuals who are activelyinvolved in promoting change, effectivelycommunicate with multiple constituents, possess a global understanding of school and district organisations, and continue to grow professionally. Embedded in definitions are the facts that distributed, parallel and teacher leadership are inextricably linked to: the nurturance of democracy through learning communities; teacher professional learning and capacity building; personal and professional growth of teachers; an increased sense of responsibility and accountability; continuous assessment practices; whole school development and improvement; and enhanced student outcomes (Huber, in Lumby et al., 2008). Teacher leadership represents a new paradigm for the teaching profession as reflected in the Teachers as Leaders Framework which was introduced and refined by Crowther et al. (2009). This paradigm is based on the views of both a better world and the power of teachers to shape meaning systems. Through collaboration new forms of understanding and practice are developed which contribute to school success and the quality of the school community in the long term(Crowther et al., 2009). When comparing the characteristics of distributed leadership and the goals of teacher leadership as reflected in the framework, similarities are evident, among others the following: having a clear vision which is shared by all members; working collaboratively in teams, groups or communities; enquiry and striving for pedagogical excellence; ownership of the developmental process; and leaders have expert rather than formal authority. Teacher leaders are teachers who develop new, collaborative relationships with the principal, school management team and colleagues, empower themselves and others and influence others towards realizing a shared vision for improved teaching and learning in a school (Katzenmeyer & Moller, 2001; Crowther et al., 2009) . Grant, Gardner, Kajee, Moodley & Somaroo (2010) identified four zones in which teacher leadership occurs, namely in the classroom, outside the classroom working with teachers and learners in extra-curricular activities, outside the classroom in whole school development activities and leading between neighbouring schools in the community. However, their study concluded that although the majority of the teachers in the study supported the notion of teacher leadership and believed that all teachers had the potential to be leaders their leadership practice was mainly restricted to their classrooms. Teacher leaders fulfil a variety of leadership roles and responsibilities, exercise a variety of leadership practices and use different modes of communication. A role-based Teachers as Leaders Framework emanated from the research of Crowther et al., (2009). This framework, which is grounded in a worldview that schools are social systems, provides clearly defined roles, responsibilities and expectations which can serve as targets for principals, school management teams and teacher leaders to aspire to. Strong interpersonal skills are at the core of teacher leadership (Snell & Swanson, 2000). Yarger and Lee (1994) asserted that the key skills of the teacher leader are the ability to work with colleagues and that these social interaction skills distinguish effective teachers of teachers, from effective teachers of children. Elements include skills such as being proactive, confident, assertive and clear communication with adults (Crowther, 1997); fluency in communicating with multiple constituents (Harrison & Lembeck, 1996); being visible in the school and to bring out the best in others (Leithwood, Jantzi, Ryan & Steinbach, 1997). Other interpersonal skills include adeptness at solving problems, resolving conflicts and negotiating rough terrain. Also, teacher leaders are skilful in leading diverse participants to shared decisions, in building trust and rapport and knowing how to be strong, but caring and compassionate (Lieberman, 1987; Lieberman, Saxl & Miles, 1988; Smylie, 1996; Yarger & Lee, 1994). A further skill domain, collaborative proficiencies, includes being proactive in the search for and creation of opportunities for collaboration (Snell & Swanson, 2000). These leaders model collegiality as a mode of work. They employ interactive skills to develop network support (Crowther, 1997), they develop a 'critical mass' of support for change, and build support among administrators. The final domain of skills which define teacher leadership, relates to administrative proficiencies. Thesemayinclude managing time, prioritising, delegation of tasks and authority, taking initiative, monitoring progress and coordinating strands of work taking place in the school (Lieberman et al., 1988). Skills in confronting and overcoming human and structural barriers, building supportive structures, securing and using resources and to conduct an organisational diagnosis are also important proficienciesfor the teacher leader (Murphy, 2005). The literature is also clear about the role of the principal and school management team in relation to the promotion of teacher leadership. York-Barr and Duke (2004) and Leithwood, Jantzi, & Steinbach (1999) suggested that infrastructure should be provided, opportunities should be created for teachers to take on leadership roles and responsibilities, learning communities should be built and teacher expertise should be celebrated. Principals should allow for sufficient time for teacher leadership activities. They should plan for and facilitate purposeful continuous professional development and reward teacher leadership initiative and involvement (Katzenmeyer & Moller, 2001; Crowther et al., 2009). In this regard Grant et al. (2008) provided strong evidence that school management teams act as an impediment to teacher leadership as they demonstrate a lack of trust in teacher leadership potential and do not distribute leadership. Instead, they autocratically control the leadership process. Studies completed by Khumalo (2008), Singh (2007), Rajagopaul (2007) and Ntuzela (2008) supported the notion of principals and or school management teams as barriers to teacher leadership, by controlling decision-making processes and being afraid to delegate authority. The role of the district in enabling teacher leadership is significant, as revealed by Maxfield, Wells, Keane and Klocko (2008). The district should set the tone for change and act as a role model in demonstrating democratic leadership. In addition, the district needs to embrace the concept of teacher leadership, advocate for and encourage support in schools. Relevant policy needs to be established and resources should be provided. Furthermore, the district should also plan for and create opportunities for long-term, purposeful continuous professional development. The findings of many studies over the last two decades have revealed a richness of benefits of teacher leadership that affect students, parents, schools, teacher colleagues and very importantly, teachers themselves (Smylie, 1996; Muijs & Harris, 2003; York-Barr & Duke, 2004; Murphy, 2005). These include the professionalization of teaching, the strengthening of the school organization and the promotion of classroom and school improvement. In relation to factors contributing to teachers' readiness to assume the roles and responsibilities of teacher leaders, Katzenmeyer and Moller (2001; 2009) highlighted three key descriptors, namely, competency, credibility and approachability. These are reflected in the teacher's professional teaching skills, personal philosophy of education, career and life stage and interest in adult education. Grant et al. 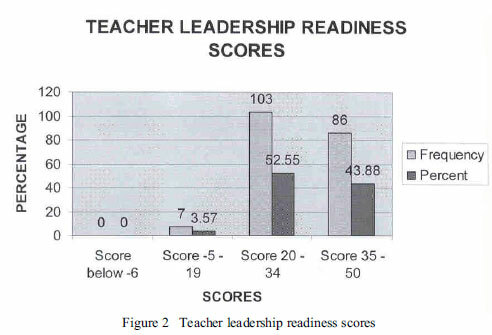 (2008) reported on a study in relation to teachers' perceptions and experiences of teacher leadership in a delegated rather than distributed leadership framework. The results of the study suggested that teachers perceived themselves to have the ability to lead and the ability to lead is not gender dependent. Finally, the literature emphasizes the importance of continuous professional development of a whole staff component, which includes formal and informal leaders, as it unifies staff in working collaboratively towards achieving a shared vision and purpose (Katzenmeyer & Moller, 2001; York-Barr & Duke, 2004; Murphy, 2005). Educators included in this study were divided into six categories: school principals, members of school management teams, veteran (10 years and more experience as teacher), middle (4 - 9 years experience as teacher) and novice (1 - 3 years experience as teacher) teachers and district officials.  What are the preliminary leadership perceptions of educators in the Eden and Central Karoo Education District?  What assumptions, in relation to teacher leadership, are held by educators?  What is the level of readiness for teacher leadership of educators?  What are the professional development needs in relation to teacher leadership as identified by educators? Each one of the above will be illustrated here. The Self-Survey of Preliminary Leadership Perceptions is grounded in the six elements of the Teachers as Leaders Framework and was developed by Crowther et al. (2009) as adapted from a questionnaire created by Katzenmeyer and Moller (2001; 2009). The questionnaire provides an indication of educators' individual and collective perceptions of leadership and their readiness for teacher and parallel leadership. The six aspects and or characteristics of teacher leaders reflected in the questionnaire are: teacher leaders convey convictions about a better world; facilitate communities of learning; strive for pedagogical excellence; confront barriers in the school's culture and structures; translate ideas into sustainable systems of action; and nurture a culture of success. Crowther et al. (2009) developed a Framework of Assumptions, which examines the underlying values that guide the work of educators. From ongoing discussions with educators, Katzenmeyer and Moller (2009) identified assumptions in relation to teacher leadership as being held by educators. These assumptions are: all teachers versus selected teachers should have leadership roles; either formal or informal leadership roles versus both formal and informal leadership roles should be held by teachers; classroom-based versus administration-based leadership roles should be held by educators; the primary focus of teacher leadership roles should be on teaching and learning versus organizational issues; teacher leaders should be responsible for outcomes versus being powerless; leaders are born versus leadership can be learned; results-driven quality professional development for teacher leadership versus disconnected staff development workshops; and teacher leaders should practice reflection versus be technicians. The four components of a professional development model, Leadership Development for Teachers, as designed and used by Katzenmeyer and Moller (2001; 2009), was used to obtain information on educators' needs in relation to professional development. The four components of the model are: Personal Assessment (Who am I? ), Changing Schools (Where am I? ), Influencing Strategies (How do I lead?) and Planning for Action (What can I do?). Katzenmeyer and Moller (2001; 2009) argued that educators developing as leaders need to collaborate with their peers to understand themselves first, then their colleagues, and finally their schools. The Teacher Leadership Readiness Instrument (TLRI) was developed by Katzenmeyer and Moller (2009) to measure the attitudes, values and beliefs of educators in relation to teacher leadership.  Survey 2 (Teacher Leadership - Educators): a longer version, which would be intended for educators, including members of school management teams, veteran, middle and novice educators. The Self-Survey of Preliminary Leadership Perceptions and Framework of Assumptions questionnaires and activities are part of an approach to leader development in school-based processes. Crowther et al. (2009) referred to their work with the IDEAS Project (Initiating, Discovering, Envisioning, Actioningand Sustaining), aschool revitalization project, which was managed through the Leadership Research Institute of the University of Southern Queensland. The questionnaires and activities were used in five distinct phases in order to facilitate a process of organizational learning. The project had been rated as highly successful in the development of teacher and parallel leadership in many schools in Australia, Singapore and Sicily(Chesterton & Duignan, 2004). The CLASS Plan (Creating Leaders to Accelerate School Success), a comprehensive approach to developing teacher and parallel leadership, had been specifically designed by Crowther et al. (2009) and associates and thoroughly tested in the field during the implementation of the IDEAS Project. The activities which comprise the CLASS Plan endorse both the features of the General Framework for Professional Development (Murphy, 2005) and Hord's concept of professional learning communities (Hord, 2003). The Teacher Leadership Readiness Instrument (TLRI) was developed by Katzenmeyer and Moller (2009) as a tool to help generate initial discussion around the concept teacher leadership. The instrument is used as part of their professional development model for teacher leadership and helps to answer the question "Who am I?" The TLRI is an activity that provides an opportunity for personal assessment by teachers themselves as to identify their underlying values, behaviour, philosophies and professional concerns that may underlie their personal performance. Katzenmeyer and Moller (2001) emphasized the value of this activity as teachers gain significant insights about themselves and their colleagues. The set of questionnaires used for the purpose of this study is widely used in training, professional development and informal activities within schools, with the focus of inviting personal assessment, context analysis, conversation amongst educators and development of insights which facilitate further discussion, visioning, planning and implementation. No adjustments were made for use of the questionnaires in the South African context. In the case of a quantitative design, two categories of external validity need to be considered, namely population external validity and ecological external validity. Population external validity refers to the extent to which the results of a study can be generalized to other people (McMillan & Schumacher, 2010). As the subjects in this study, namely educators, have certain characteristics and can be described with respect to variables as gender, educator type (principal, district official, educator (member of school management team, veteran, middle, novice) and school type (primary, secondary, special), the results of this study could only be generalized to other people who have the same or similar characteristics. For the outcomes of this research project to be reliable, it must demonstrate that if it was to be carried out on a similar group of respondents in a similar context, then similar results would be found. It was therefore of importance to establish whether the calculated measures or scales used in this study, acted as reliable indictors of respondent perceptions to the various aspects of teacher leadership. Reliability, more specifically internal consistency reliability, was evaluated by means of scale reliability testing. Non-probability sampling, specifically purposeful sampling, was used for this study, because the researchers selected particular subjects from the population who would be representative or informative about the topic of teacher leadership. Data for this study were collected in 61 schools, including 45 primary, 12 secondary and 4 special schools in the Eden and Central Karoo Education District. The sample consisted of specific categories of educators in the schools, including 61 principals, 52 members of school management teams and 89 veteran, 29 middle and 26 novice educators. 26 district officials were also included in the study. The sample size was 283 in total and included 137 female and 146 male respondents. Application was made to conduct the study in 134 schools, as well as to include the district officials of the education district. Permission was granted by the Western Cape Department of Education. Participation in this project was invited on a voluntarily basis and confidentiality aspects were highlighted in the letter of invitation to schools, as well as included in the instructions section of the survey. Both postal and internet-based surveys were used. Postal questionnaires wereadministered in schools, with educators, including the principal, a member of the school management team, veteran, middle and novice, as respondents. Internet-based questionnaires were administered in the education district, with district officials as respondents. A preliminary invitation to participate in the research project was sent by the researcher to each of the 134 schools in a personalized email message. This message included a covering letter, a copy of the letter of approval by the Western Cape Education Department, as well as a notification that the surveys would be mailed to schools, addressed to the school principal. A research pack was sent to each of the identified 134 schools. The mailed research pack included a cover letter, five copies of the survey and a stamped return-addressed envelope. The five copies included one copy of Survey 1, intended for the principal, and four copies of Survey 2, intended for educators, one each for an educator-member of the school management team, veteran, middle and novice. At the time of the closing date for surveys to be returned to the researcher, a final reminder email message, requesting completion of the survey, was sent to each of the schools with outstanding surveys. The district officials received an electronic email-based survey. The email included a covering letter, a copy of the letter of approval by the Western Cape Education Department and the link to access the online version of the survey. Instructions for completion of the survey were attached to the survey. At the time of the closing date for the completion of surveys, a final reminder and request to participate were sent to all district officials. As previously mentioned, the responses of completed surveys (paper-based) were manually added to the database. The database was created on the software program Survey Monkey. The responses of the completed surveys (email-based) were collected through the software program Survey Monkey. For the purpose of statistical analysis, the data were shared with the statistician by creating a link which could be accessed via the software program. The scoring and statistical processing of the four questionnaires were done as explained by Crowther et al. (2009) and Katzenmeyer and Moller (2009). To describe the biographical attributes of the sampled population, one-way frequency tables on all characteristics queried in the survey were calculated. The four descriptive research questions of the study were answered by means of four general composite frequency analyses which were completed. The response distributions of questionnaire items, pertaining to one of the four aspects of teacher leadership, are represented. The calculation of summative measures for each aspect of teacher leadership was necessary in order to identify the underlying trends and relationships in the data more accurately and parsimoniously. 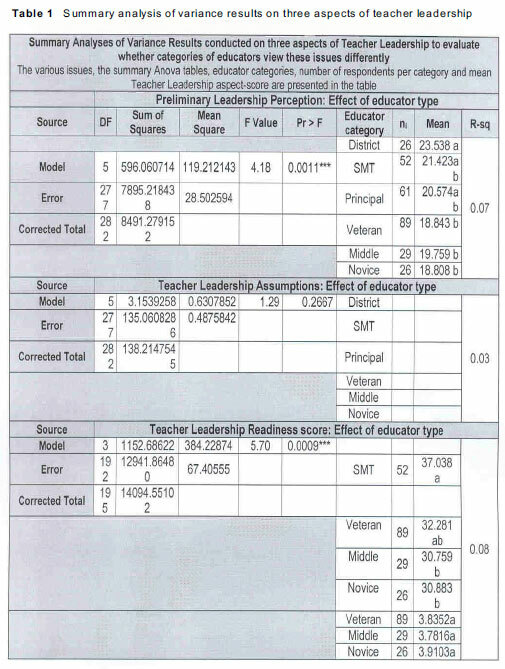 A one-way analysis of variance (ANOVA) was used to investigate the probable effect of the biographical variable 'educator type' on the different aspects of teacher leadership. Furthermore, linear regression analyses were conducted on the relevant sets of scores or scale values. The relationship between preliminary leadership perceptions and readiness for teacher leadership was illustrated by means of a two-way frequency table. This included categorized values, calculated Chi-square statistics as well as graphs of the fitted linear regression lines and plots of observed or scale values. The regression analyses were performed on 196 of the respondents, which included educators (members of school management teams, veterans, middle, and novice). This study found that educators in the Eden and Central Karoo Education District collectively demonstrated readiness for teacher leadership as their attitudes, beliefs and values aligned with the tenets of parallel and teacher leadership. Evidence for this finding was reflected in both the analysis of the preliminary leadership perception scores and the teacher leadership readiness scores. 96.9% and 96.43% of the respondents respectively showed a high level of readiness for teacher leadership (Figures 1 and 2). 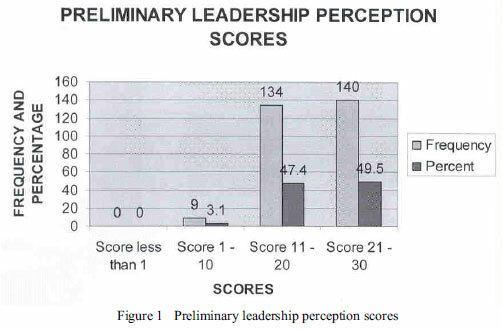 From Figure 1 it can be concluded that 49.5% of the respondents indicated that virtually all their attitudes, values and beliefs aligned with the tenets of teacher and parallel leadership; 47.4% of the respondents indicated that the majority of their attitudes, values and beliefs aligned with the tenets of teacher and parallel leadership; and 3.1% of the respondents indicated that some of their attitudes, values and beliefs aligned with the tenets of teacher and parallel leadership. Figure 2 shows that 43.88% of the respondents indicated that virtually all their attitudes, values and beliefs parallel those related to teacher leadership and 52.55% of the respondents indicated that the majority of their attitudes, values and beliefs parallel those related to teacher leadership. Only 3.57% of the respondents indicated that only some of their attitudes, values and beliefs parallel those related to teacher leadership. These findings suggest that educators held the following views on teacher leadership: teaching is as important as any other profession; teaching means that educators should stand up for all students, including those who are marginalised and disadvantaged; teachers should actively participate in policy making; educational leaders should convey optimism to students, colleagues and parents; the mentoring of new teachers is part of the professional responsibility of teachers; teachers are responsible for encouraging school wide approaches to teaching, learning and assessment; and teachers should play an active role in decision-making about instructional materials, allocation of learning resources and student assignments. In view of the factors that may influence teacher readiness to assume leadership roles and responsibilities as suggested by Katzenmeyer and Moller (2001; 2009), it would be important to consider the educator type of the respondents of this study: 61 (22%) principals; 52 (18%) members of school management teams; 89 (32%) veteran educators; and 26 (9%) district officials, while 29 (10%) and 26 (9%) of the total population were represented by middle and novice educators. It can be postulated that, by considering the factors contributing to teacher readiness for teacher leadership, 81% of the total population might be experienced and skilled teachers and in a more advanced life stage, which might impact positively on their overall perceptions, values and beliefs regarding leadership and more specifically teacher leadership. This could have impacted on the outcome of the study. Should this finding highlight a readiness of current school leaders and managers, it should be viewed positively as it reflects the willingness of leaders and managers to discard more hierarchical leadership structures and to invite and embrace deep democratic leadership practices in schools. From the results it can also be concluded that educators in the Eden and Central Karoo Education District felt very strongly about the following: cooperation rather than competition with colleagues; to work in an environment where they are recognised and valued as professionals; the importance of having the respect of school managers and other colleagues in the school; and the need for time and opportunity to discuss their values and beliefs about teaching with colleagues. In relation to educators' assumptions about teacher leadership, it was found that respondents held positive assumptions about teacher leadership, with strong agreement with regards to the need for teachers to take on leadership roles and opportunities in schools. They feel that teacher leadership can be nurtured, that teacher leaders have pedagogical credibility, and that they work collaboratively with others. Respondents were however divided in the assumptions they held in relation to aspects such as how and if teacher leadership differs from other forms of leadership. They were also divided regarding what the focus of teacher leadership should be, whether all or some teachers are potential leaders, whether teacher leaders are identifiable through assessment or could emerge unexpectedly, and whether teacher leaders are popular with colleagues. This finding correlates with the outcome of studies completed by Grant et al. (2008) as educators mainly support the notion of teacher leadership, but are unsure about what exactly teacher leadership is, how it should be nurtured, as well as the focus thereof. From the results of this analysis, it can also be derived that the underlying values that guided the work of educators in the Eden and Central Karoo Education District to achieve organisational change, corresponded with some of the assumptions in relation to teacher leadership as highlighted by Katzenmeyer and Moller (2009). These assumptions include: that more teachers should take empowered and professional roles as teacher leaders; that teachers prefer to focus their attention and energy on leadership activities which will benefit students; that teachers can learn leadership skills through effective professional development, providing that they are provided with opportunities to practice and apply knowledge about leadership; and that planned, purposeful, systemic long-term professional development is preferred by teachers. Educators were also in general agreement that professional development needs in the field of teacher leadership do exist. This finding is consistent with the findings of the Framework of Assumptions questionnaire, where educators in the education district indicated that they believe teachers can learn leadership skills through effective professional development. Planned, purposeful and systemic long-term professional development is the preferred approach. It is also consistent with findings as documented by York-Barr and Duke (2004) and Crowther, Kaagan, Ferguson and Hann (2002), where it was indicated that both formal leaders and teachers be trained and prepared for teacher leadership. With regard to the research questions on differences between educator types, significant variances were found for the following aspects of teacher leadership, namely, preliminary leadership perceptions and readiness for teacher leadership. This study found that the preliminary leadership perceptions of district officials differed significantly from those of veteran, middle and novice educators. It is important that district officials have significant relationships with the educators and schools within their circuit. This serves to inform the district official of the reality of systems, structures and cultures within schools. If this is lacking, it is possible that district officials will have different perceptions in relation to certain aspects of teacher leadership. It is also important that district officials exercise leadership in the area of teacher leadership. This implies continuous discussion and exchanging of thoughts and ideas in the field of teacher leadership. Furthermore, it was found that the readiness for teacher leadership perceptions of members of school management teams differed significantly from those of middle and novice educators. The analysis of variance indicated that assumptions regarding teacher leadership and professional development needs in the area of teacher leadership were not significantly impacted by educator type (Table 1). A significant linear relationship between preliminaryleadership perceptions and readiness for teacher leadership had been established. The R-square value of 0.46 indicates that 46% of the variation in the data can be attributed to the established relationship. 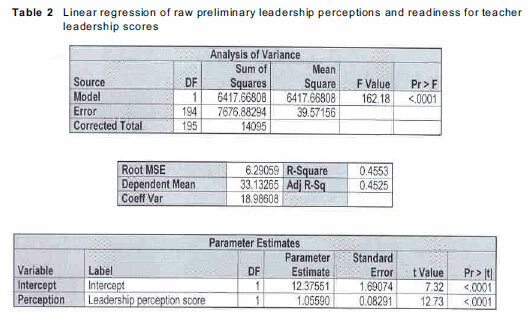 Table 2 shows that a positive relationship was found between leadership perceptions and teacher leadership readiness. As preliminary leadership perceptions improve, readiness for teacher leadership will also improve. It can be inferred from the results of the study that a high level of readiness for teacher leadership had been indicated for educators in the Eden and Central Karoo Education District. Educators' preliminary leadership perceptions, assumptions about and readiness for teacher leadership proved that the majority of educators are ready for a more distributed, deep democratic leadership practice in schools. Educators acknowledged the need for continuous professional development in the area of teacher leadership. It was also found that as preliminary leadership perceptions of educators improve or strengthen, readiness for teacher leadership is also likely to improve or strengthen. It is evident that educators are ready to embrace democratic leadership practices in the teaching profession. Educators are ready to convey convictions of a better world, facilitate communities of learning, strive for pedagogical excellence and confront barriers in the school's culture and structures. They are ready to translate ideas into sustainable systems of action and nurture a culture of success. The dilemma is: educators support the notion of and is ready for teacher leadership, but in reality the actual practice of leadership beyond the classroom is limited. It was suggested by Grant and Singh (2009) that an authorised form of distributed leadership should be facilitated in schools, the workings of the hierarchy gradually be removed and a shared practice of leadership be adopted. Only then a more democratic form of distributed leadership should be facilitated in which all role players can collectively participate in a process of strategic school planning. In order to facilitate a process of growth and development in schools, mature leadership is needed to start with. School leaders and management teams create a climate in which distributed practices are invited or hindered. It is therefore recommended that school principals, school management teams and other leaders in schools are included in a process of capacity building and professional development in the area of distributed and democratic leadership practices. Both the Department of Education and the education district have a significant role to play. It can also be argued that each school is unique, with its own leadership style, culture, climate, policies and practices. Therefore it may be more efficient to support each school and its whole staff component in facilitating more open, transparent and shared leadership practices. Teacher leadership is fundamentally about development of collaborative relationships across the spectrum of educators at a specific school. Opportunities should therefore be created within the school system to facilitate the development of these collaborative relationships. In this manner, all members of staff (formal and informal leaders) can collectively participate in the process of school and leadership development, take ownership of the school development plan and realize their potential as educators and leaders. Teacher and parallel leadership - distributed and shared leadership theory and practice - should also be prioritised and included in teacher preparation courses, both on under- and post- graduate level. Furthermore, new teachers entering the profession should be mentored and opportunities should be provided for them to develop their leadership skills within their respective schools. In doing so, schools will follow the international agenda with regard to development in the field of leadership and management. More so, educators will be empowered, professional communities will be developed and continuous professional development will guide educator growth and development. This would enhance educators' motivation, productivity, morale, job satisfaction and general well-being. The outcomes for students are numerous. Further research could focus on the readiness of less experienced educators (middle and novice), who do not necessarily fulfil leadership roles, as well as district officials, in order to obtain a more representative viewof their perceptions and readiness for teacher leadership. The study is limited due to the fact that the majority of the respondents represented more experienced educators who probably already fulfil leadership roles and responsibilities. Furthermore, the response rate of district officials was unsatisfactory. Crowther F, Ferguson M & Hann L 2009. Developing teacher leaders: How teacher leadership enhances school success. 2nd edn. Thousand Oaks, CA: Corwin Press, [ Links ]. SG (Fanie) Pretorius is Professor in the Department of Teacher Education at the University of South Africa. He is widely published and his interests include comparative education, education management, and languages. He has 22 years teaching experience.